Noonbarra Prince was owned by John Salter of Gumble, NSW. We first used him as a sire when he was around 12 years of age and by that time had a badly damaged leg from two separate farm injuries. Over his last couple of years we were unable to get a natural mating from him because of this, so we got the vet to do a number of unfrozen (natural) inseminations. Right from a puppy he was an easy dog to train. Mr. Salter often commented on how quickly he learned new things. 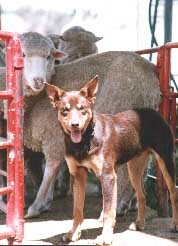 He was a good dog in the paddock and had a lot of natural ability in holding and bringing sheep. He was also often used in droving sheep and in yard work. The feature that really stood out was his wonderful nature. He was a dog that was easy to like. He was a very friendly dog and loved to be patted. He was very faithful and liked to stay close to his owner. He got quite upset if Mr. Salter took other d ogs out to work and left him at home. Noonbarra Prince is a full litter brother to our late top sire, Noonbarra Gabe and showed his kind, gentle temperament as well as many of his outstanding working traits and incredible brains. We have used him three times as a sire since Noonbarra Gabe died and we are very pleased with the results. 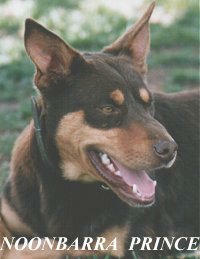 Prince produced a lot of outstanding Kelpies. Noonbarra Marco, Noonbarra Dusty III , Noonbarra Buffy, Noonbarra Libby II, Noonbarra Jillaroo, Noonbarra Megan, Noonbarra Flash and Noonbarra Kara are just a few of his excellent offspring. He has progeny working in the USA, and Norway as well as Australia. Pace was another outstanding young pup by Roy X Megan. 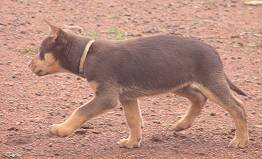 Megan has always produced us exceptional working dogs and it was good that we were able to get one to well known dog man Kerry Archer. Kerry works as a stock contractor and also runs a lot of his own stock. In the past he was a Yard Dog Trialist. 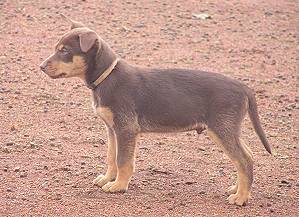 Pace was everything you could want in a pup. He was working from 8 weeks of age. He showed a lot of courage but kept his head. 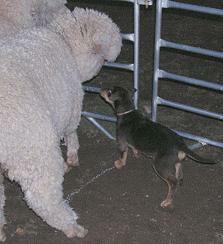 He had break out and distance in the paddock and in the yards was amazing at backing the sheep. He could even jump the gaps. 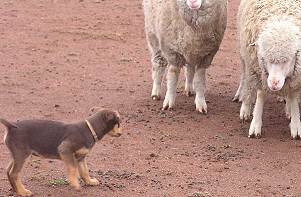 Noonbarra Pace as a tiny puppy backing a mob of sheep out of the race! 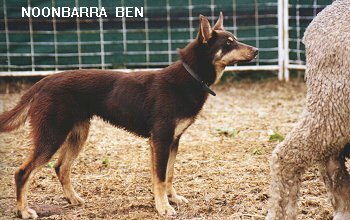 Noonbarra Ben went to a small Boer Goat Stud near Orange NSW. He was well started before we sold him and could work in the yards and the paddock quite well. He was a strong, fairly forceful dog. W hen we took him out to the goat stud he had never seen a goat before but within a few minutes he was working them well and brought them up to a set of yards. The goats were used to a Border Collie and had been able to bluff the dog quite a bit. A few goats turned on Ben and were aggressive but he just nipped them on the nose and that soon got them moving well. He backed them in the yards and quickly got the race filled. It was quite impressive for a dog with no experience in this job.